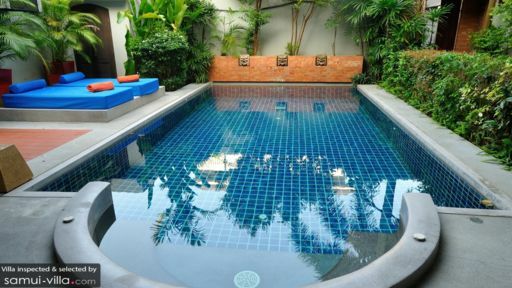 Villa Tawan is a modern three bedroom haven situated on the island of Koh Samui, a relaxing and tourist friendly place. With its variety of amenities such as an outdoor theater, semi open plan ensuite bathrooms, and comfortably chic living spaces, Villa Tawan is a good location in which to spend the holidays with family and friends. Top it off with a plethora of top notch services such as a concierge, room service, and accommodating staff, Villa Tawan is definitely an excellent choice for your next vacation. On the other side of the open plan living and dining space is the master bedroom. It has sliding doors that reveal a part of the garden area. In the center is a comfortable bed where you will get some good quality rest. The master bedroom also has a gorgeous airy en suite bathroom with cabinetry and a large tub, perfect for evenings when you want to unwind and pamper yourself. The master bedroom also has a private terrace. There are two guest bedrooms here at Villa Tawan. Both are located on the upper floor and have clean open plan ensuite bathrooms. Each room has a modern design with some wooden finishings, elevating the space’s sophistication. Double beds complete the experience in each bedroom, helping guests reach a blissful state of sleep. One of these two bedrooms also has a balcony that overlooks the pool and garden area. The highlight of Villa Tawan’s outdoor and pool area is the option for an outdoor movie screening. By the blue tiled private pool is a video projector and 3 meter screen from which guests can watch a movie, at night while munching on some snacks, while laying back on one of the lounge beds by the pool. You can also have dinner or dessert in the outdoor dining area while watching a movie. It’s definitely a fun and exciting way to spend your evening. If that’s not your fancy, you can also go for a nice afternoon or evening swim in the pool. Villa Tawan has an open plan living space on the ground floor. The living and kitchen area is modern and cosy, providing an intimate venue for some great dinner parties with family and friends. The kitchen is fully equipped, ready for some delicious meals to be made, while the dining table can fit six people. This living space opens up to the pool area, giving the space a pleasant relaxed tropical vibe. The staff here at Villa Tawan are highly trained and attentive to your needs. Villa Tawan is perfect for guests who want a more intimate and private experience with their family and friends, while receiving top notch service. Staying at the villa will give you access to a variety of services and amenities such as yoga classes, spa treatments, and even a private villa chef, should you choose to avail of these. A car, bicycles, a motorcycle, and even speed boats are also available for hire. Whatever your needs may be, the staff here at Villa Tawan will strive to meet them. Located in the Ban Tai Estate, on the island of Koh Samui, Villa Tawan is perfectly situated for you to have a fun and engaging time with your family and friends. On the estate is the Ban Tai Beach where the entire family can spend a highly entertaining afternoon playing in the sand. Guests can also get a chance to visit Ang Thong National Marine Park, which is an outdoor lover’s dream, with its hiking trails and opportunities for kayaking. Guests can take either a speed boat or traditional boat tour of the park. On the island of Koh Samui itself, there are a number of restaurants and bars where you can dine in.